This trek begins close to Manali, in Dhundi village. On the first day, you'll trek through meadows and along a river, until you get to Bakarthach. This is a wonderful campsite surrounded by an amphitheatre of mountains, and it serves as a base camp for the next day's trek to Beaskund. Beaskund is an glacial lake that lies in the lap of the Himalayas, surrounded by serene meadows studded with boulders. This Beaskund trek offers you spectacular views of the Pir Panjal and Dhaulagiri ranges. • Climb to 12,500 feet to see an emerald-green lake formed by a glacier. • Get spectacular views of the Pir Panjal and Dhaulagiri range. 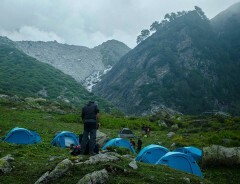 • Have 3 days of outdoorsy adventure in the highlands of Manali. • Enjoy the simple delights of a bonfire and camping under the stars. Participants must adhere to the instructions of the trip leader/guide at all times during the trek to Beaskund. Consumption of alcoholic beverages, drugs or other illeagal substances is not permitted on the Beaskund trek. Do not litter and deface the natural environment on your trek to Beaskund. Participants must be kind and respectful to the local people and any wild animals during the trek to Beaskund. For cancellations made 7 days or more before the Beaskund trek departure date: 70% of the cost will be refunded, minus any transaction charges. For cancellations made 3-6 days before the Beaskund trek departure date: 50% of the cost will be refunded, minus any transaction charges. For cancellations made 0-2 days before the Beaskund trek departure date: No refund. Participants must inform the operator of any disability, pregnancy, mental or physical medical condition he/she is facing before booking the Beaskund trek. 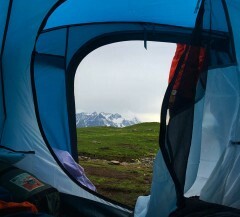 The operator reserves the right to accept, decline or expel any participant from the Beaskund trek without any refund, if their behaviour is causing any harm to the group. Please carry ID proof and any other necessary documents. The operator reserves the right to cancel, alter or change the Beaskund trek itinerary under circumstances beyond control of the operator such as natural calamities, road blocks, landslides, accidents, etc. Any extra charges arising from these circumstances will have to be borne by the participants. There are no refunds for any services missed or not utilised during the Beaskund trek. If the operator cancels the trek to Beaskund due to unforeseen circumstances, you can choose between an alternate trek, a voucher which will be redeemable for a year, or you can book another trek of your choice. Any refund will be as per the cancellation policy. You'll have to report to the meeting point by 10:00 hrs, from where you'll be driven to Dhundi. This hour-long drive takes you through Solang Valley and up into the highlands of Manali. At Dhundi, you begin your trek to Bakarthach. It's a gradual ascent of about 4.5 kms. You'll be trekking through alpine meadows and along the banks of the Beas river for a stretch. You'll get to Bakarthach by early evening. 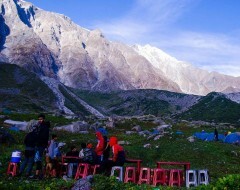 This gives you plenty of time to relax, enjoy some tea and snacks, and watch as evening falls on the peaks around you. A campfire is lit, and you'll be served hot soup before dinner. After that, you'll head to your tents for the night. It's Beaskund day! You'll wake up early and eat a good breakfast before the day's trekking begins. Today's climb presents more of a challenge, because you'll be hiking through meadows strewn with huge boulders. Once you get to Beaskund, you'll have some time to explore. You'll begin the descent to your campsite at Bakarthatch after that, and will spend the rest of the evening around a campfire. After a hot dinner, you'll retire to your tents for the night. You'll wake up early today and take part in a yoga session, with soft music and some gentle poses. After yesterday's climb, you'll need a few stretches to loosen up, and there's no better place than here, with the mountains around you. After some hot tea and breakfast, you'll begin your trek back to Dhundi. It is a downward descent throughout, following the same route you climbed previously. You'll board the vehicles waiting at the road head and will be driven back to Mall road. You should arrive in Manali by 17:00 hrs. Trip ends here. You'll start your morning with a healthy breakfast and a hot cup of tea. Today you'll carry a packed lunch with you for your trek to Beaskund. You'll return to the campsite in the evening, in time for tea and snacks. You'll enjoy another evening under the stars, with a campfire and soup. It's been a long day and you'll be happy to retire to your tents for the night. You'll wake up for a yoga and meditation session today, and will enjoy a hearty breakfast after that. You set off on your trek back to Dhundi today, carrying a packed lunch with you. You should reach Dhundi by 16:00 hrs and from here you'll be driven back to Mall road in Manali. Your trip ends here. You can get to Manali by flight (Kullu airport, about 60 kms away) or by bus from Delhi or Chandigarh. 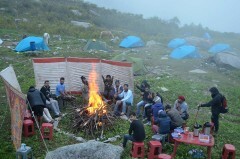 Your operator will arrange the transport to the start point of the Beaskund trek.